All our prices include collection from your local printing.com studio. You can also collect from our Production Hub – you’ll need a collection card – please ask your studio for one, as we can’t release your order without it. We can also deliver directly to your premises, or anywhere you like. We use reputable overnight carriers who publish an on-time success rate of 98.5%. If you order 2 or more items, we may despatch each as soon as it’s ready. Don’t worry though, we’ll only charge you for delivery once. We charge delivery based on the total weight of your order, so the more you order, the cheaper each item gets. We’ll show you the delivery price of any item when you add it to your basket. In the unlikely event that we fail to despatch on time, read about Our guaranteed fast turnaround. If you’d like your order delivered to more than one address, or to Europe or further afield, please contact us for a quote. You’ve got the power to make us work even more quickly. With our new flexible turnaround options, you can choose your turnaround and choose your price. 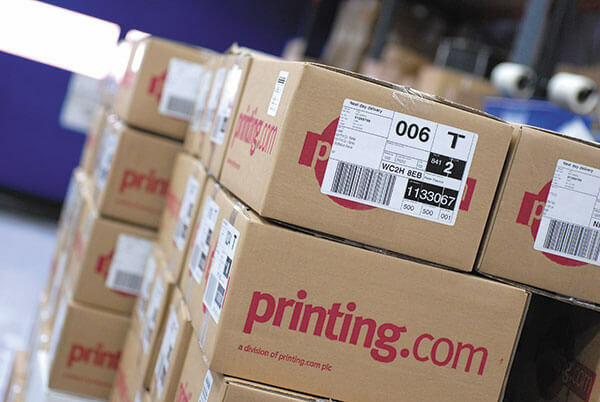 Our low prices mean we have to work ultra efficiently, so speeding up your order means we rack up lots of extra costs. To help contribute to these costs, we add a small premium to the normal print price – it’s only fair. 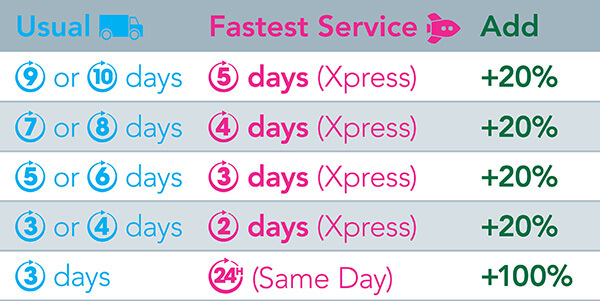 For instance, a print item with normal turnaround of 10 working days is also available in 9, 8, 7, 6 or 5 working days with our Xpress Service – the less urgent your order is, the lower your price is. Left it to the last minute? Or someone just sprung something on you? No problem! Approve your artwork by 10am and we’ll despatch your order the same working day on a wide range of items. Just choose SOS delivery when creating your order and we guarantee we’ll despatch your order the very same day or pick up from our Manchester hub that night.